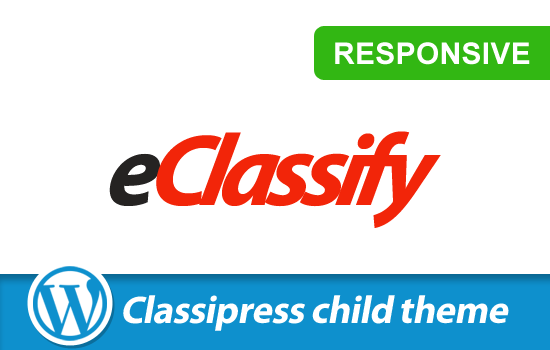 Classy is a modern, clean, intuitive, and fully responsive child theme for ClassiPress that will help you create, manage and monetize a local or global classified ads website. 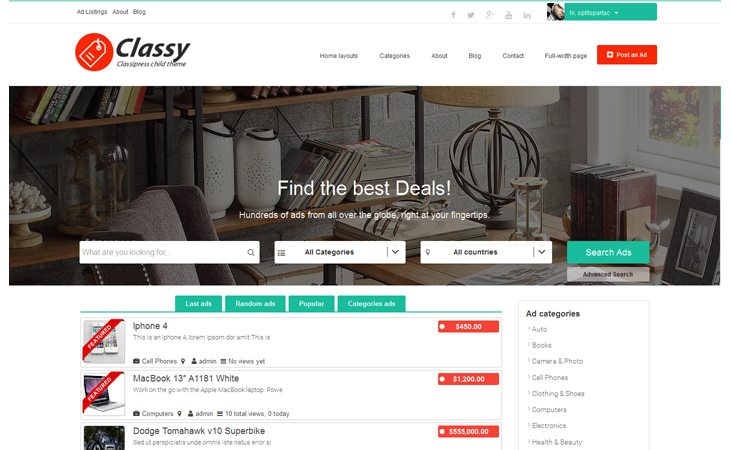 It is fully customizable theme with tons of options, unlimited colors, font variations, and countless other options to tweak your classified ads website. As it was highly required by our customers, we have created the classified-version of Joby theme to make a powerful combination. Imagine you want to create a classified ads website and a job board at the same time, but you don’t want the users of both sites to notice that they are browsing two websites. If so, then this is the right solution for you. Did we mention that you could use this to make money? Before you decide that this is or isn’t the best theme for you, let’s highlight one more way you can make money with this theme. We’ve gone even further to also support ad spaces. So even if you don’t want to charge for anything else, you can still earn money by placing advertising banners such as AdSense which we have created a module for it. Classy is a mix of beauty, functionality and ease. Creating a classified ads website has never been easier. Works out of the box – just install the theme on Your ClassiPress theme, activate and you are ready. 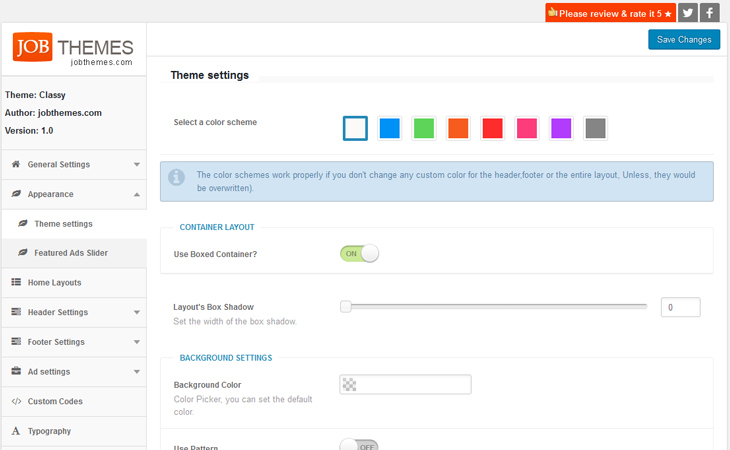 Classy theme options panel allows users to customize the theme in an easy and simple way. Click-Click-Done .There’s no code knowledge required. 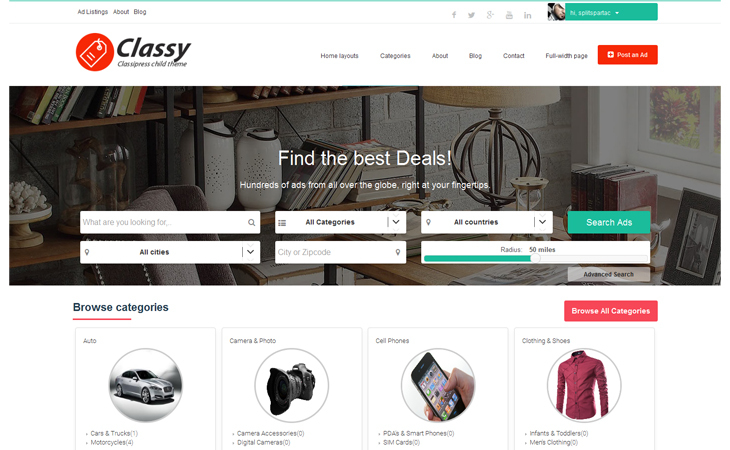 What you need to create amazing classified ads websites with no coding knowledge, Classy comes with the multiple options panel. 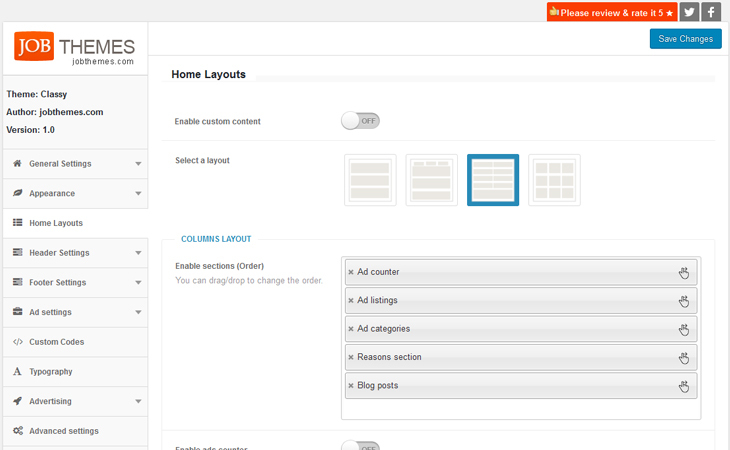 Choose one of the pre-set home page templates : Default, Tabbed, Columns and categories. each template has tens of options such as : Ad counter, Blog posts (Career advices and News); Reasons section, Ad categories’ list, and an extra advertising banner. You can customize the search bar by choosing from its option: a location google map text field or location select menu (cities, states or countries) that you set in the back-end.along with other options. Also, advanced search mode is an option. 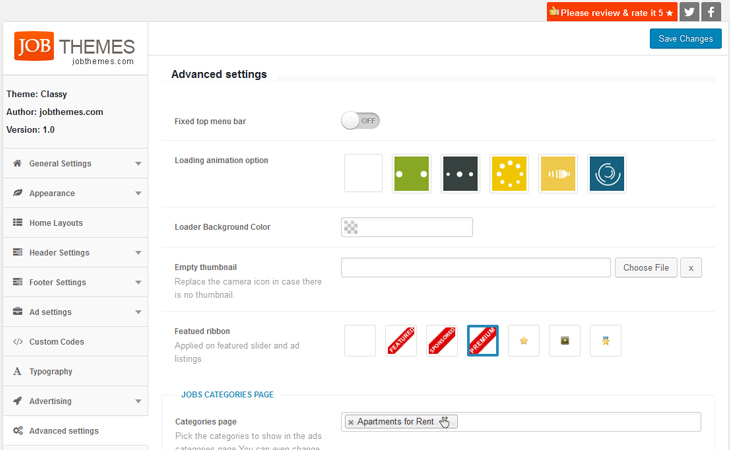 You can customize the elements to show on the ad listings’ loop.Drag and drop them with ease. We have created a clean template for the ad single page, a fully-customizable one! You can display related ads in the ad single page.activate/deactivate it, how many ads to display are optional. 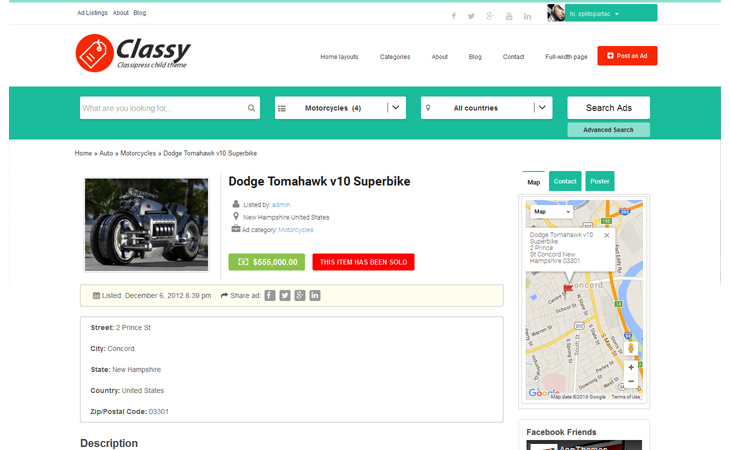 Classy came packed with testimonials module, Show up what your clients say about your classified ads website. With the built-in color pickers in Classy theme options you can change the color of nearly every element of your website. Classy is fully responsive. its compatible on all new & latest browsers tablets and mobile devices. Use unlimited Google fonts or upload custom fonts, set sizes, style, weight and much more.Classy options panel gives control on fonts. Classy built with following the best SEO practices to help for best ranking in search engine for your website compatibility. Classy includes a contact form page which you can customize through the themes options’ panel, also, You can show the address’ using an embed google map. 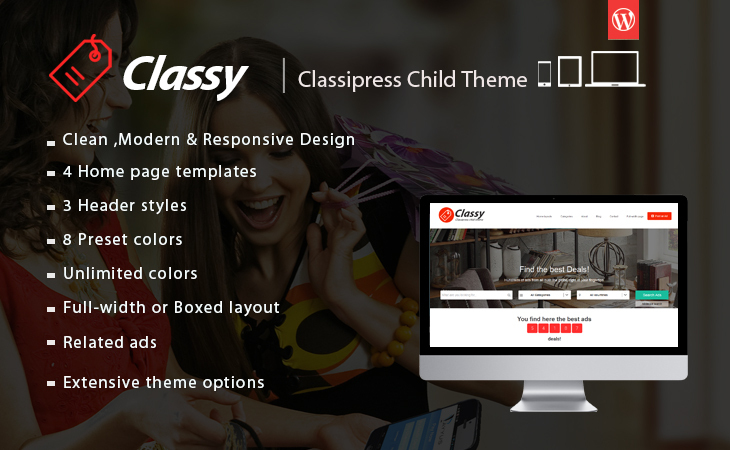 Classy was built on Bootstrap , the most popular HTML, CSS, and JS framework for responsive websites. There are more other options , we try to list few here such as : Featured ads slider option, Set an animated page loader effect, Upload an image if there is no ad listingimage, Featured ads ribbons (upload your own), Patterns ready, Social media icons,Top fixed menu or not , Full-width page template !……When we said there are tons of options in the backend, We meant it. Your Classy now is installed and ready for use. My Website was at it worst after I install this theme. I like this setup very well, you just have to search hard and long to find information on how to use it. I think there need to be an instructional manual that comes with it, since it have so many features. Quick support is there when you need it but I am one who like to figure out thing for myself first. I just want to say that this is a GREAT theme. Support from Spartac is also GREAT. Did not expect to get that much help, but I was surprised. If you are thinking of buying. I highly recomend. Compré este tema y estoy muy contento (Falta limar algunas opciones) Pero por lo demás perfecto. Tienen un soporte excelente. Lo recomiendo 100%. Beautiful theme, easy to customize, and very good support. Thank you very much! This theme took my site to a whole new level! The developer is fantastic, he responded to a couple of modifications immediately. The results are more then I expected. Este tema é fantástico! Esperamos é claro algumas correções, mas muito prático, usual e moderno. Parabéns!!! I had was purchased this Classy child theme. Classy theme is not compatible with classipress 4.x. When this theme will be compatible with classipress 4.x? we are about to finish the new update. it’s completely different in the functions and codes, we had to do all from scratch by keeping the appearance of classy + enhancing it more. We work day and night, 2 developers on classy 2.0.we try to finish it by tomorrow. 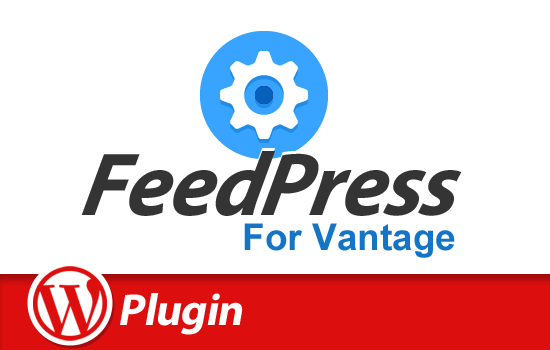 we faced few issues while updating and upgrading to calssipress 4.X but it’s almost done, only packing it up and wrapping it t hen send it to the marketplace, Sorry wzoj for the delay. Hi Spartac, did the childtheme is now compatible with classipress 4 or not yet? Hi Math,Thank you for purchasing our Eclassify. We are actually working so hard to update classy which is 99.9% done and eclassify is almost 3/4 done. nothing that much to complete. so you decide, either you ask the refund from appthemes and you get all your money back, then you wait until we release classy upgrade and you purchase it or you purchase it and once we release the update you’ll get it instantly. Anyway, we are updating eclassify,Classy, and Flatron. thx for the feedback Spartac, if you say you gonna release it soon its all good for me dont want a refund in that case 🙂 Now i see that classy is now updated for classipress 4! thats good news! Thx and keep on the good work! Hi math, Sorry for the delay to reply you. we actually updated it we will keep enhancing it more and more. Our first and last concern is making our customers happy, this is something we love to do because we try to make stuff that helps our beloved clients make business.not just another wordpress theme. I appreciate that you didnt get teh refund, but you must get something extra for free man, You name it, I will be happy to provide it with a big smile. Çalışmayı takdir etmekteyim. Ben sizin çocuk temayı almaktan memnunum. Ancak 2 eklenti aktif olmadı. wpclubz-tabbed-widget ve wpclubz-post-types bu PCLZIP_ERR_BAD_FORMAT (-10) : Invalid archive structure mesaj görüldü. Sizden hangi adresten destek sağlanır ben anlayamadım. O nedenle buradan yazıyorum. The files “WPclubz Post types” and “WPclubz Tabbed Widgets” are not installed, they are broken. Please help. Hello, you have problems with the plugins, I am asking for help by mail and do not answer me. now after 2 weeks even no support..whats happen with jobthemes_? 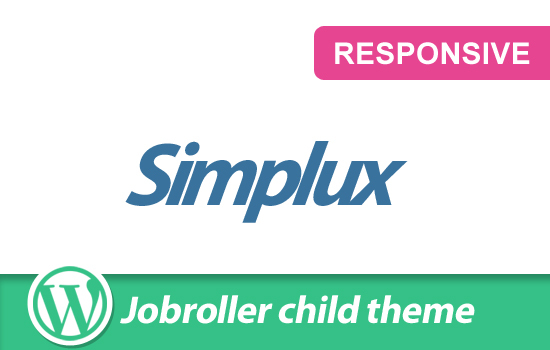 An incredibly powerful and super flexible JobRoller child theme.